Continue via Why Ayn Rand Is a Fan Favorite Among Christian Theocrats | Alternet. via 5 libertarian oligarchs who made fortunes off the government they want to destroy – Salon.com. Herbert Spencer was a popular author during the nineteenth century who supported strict limits on the government and even opposed many forms of charity towards the poor. Nature, Spencer argued, “secures the growth” of the human race by “weeding out those of lowest development,” and he also believed that neither government nor private charity should interfere with this process of natural selection. Though Spencer was not a eugenicist — he actually argued that the poor should be treated much more harshly than nineteenth and twentieth century eugenicists did — he was both a social acquaintance of Sir Francis Galton, the father of the eugenics movement, and a significant influence on Galton’s thinking. Spencer also shaped many of the policies developed by some of the most powerful judges and lawmakers of his era. Reading Spencer’s many works today is an uncomfortable experience — the man devotes hundreds of pages to establishing a philosophical justification for a kind of neglect that most Americans would now view as a moral atrocity. Yet Spencer is also one of the foundational thinkers in the development of the economically libertarian philosophy that drives politicians such as Sen. Rand Paul (R-KY). via The Immoral Intellectual Roots of Libertarianism | ThinkProgress. That’s Paul Ryan, Republican vice-presidential candidate, in a 2005 speech delivered at The Atlas Society–one of many lavishly funded organizations devoted to spreading the thought and philosophy of Ayn Rand (he’s since distanced himself). fig. 2. To hell with your ‘flu shots,’ parasites. The fantastically rich find in Rand’s celebration of individual achievement a kindred spirit, and support her work with pecuniary enthusiasm: in 1999, McGill University turned down a million-dollar endowment from wealthy businessman Gilles Tremblay, who had given the money in the hopes of creating a chair dedicated to the the study of her work. Then-president Bernard Shapiro commented that “we can’t just sell our souls just for the sake of being richer,” hopefully aware of the irony: what else is there but getting richer? Rand literally ends her most famous novel, Atlas Shrugged, with the dollar sign replacing the sign of the cross, traced in the air–indicating the dawn of a new, bold, daringly sophomoric era. Rand’s books have sold in the millions, never quite losing steam in the half-century since publication. A now-infamous Library of Congress survey placed Atlas Shrugged as the second-most influential book in America, trailing only the Bible–a dubious pairing, perhaps, given Rand’s militant atheism, but one that indeed captures the uneasy tension of contemporary America: the celebrated Protestant ethic versus the spirit of capitalism. Despite her popular appeal, perennially best-selling books, and the breathless testimonial of politicians, actors and businessmen–Ryan is scarcely alone in his praise–professional academics almost universally disdain Rand. An online poll by widely-read philosophy professor and blogger Brian Leiter had Ayn Rand elected the one thinker who “brings the most disrepute on to our discipline by being associated with it,” by a landslide. She is almost never taught in classrooms. Her name elicits jeers and funny, exasperated tales of fierce, bright undergraduates under her spell arguing her case for hours on end. This near-unanimous rejection has led to some remarkably uncharitable, and bizarre, attempts to explain away the lack of academic interest: in the Stanford Encyclopedia of Philosophy entry on Rand, its authors write that “her advocacy of a minimal state with the sole function of protecting negative individual rights is contrary to the welfare statism of most academics,” claiming outright that the overwhelming majority of professional philosophers and political theorists have been simply unable to fairly evaluate her work because of the biasing factor of their prior political commitments. Somehow the same ‘welfare statism’ of academics has not prevented the close study of Robert Nozick’s landmark Anarchy, State and Utopia, a sophisticated libertarian text that mounts an original, and far more effective, argument against redistributive policies. Apart from John Rawls’ A Theory of Justice, there is perhaps no more commonly-assigned book in undergraduate political philosophy classes. 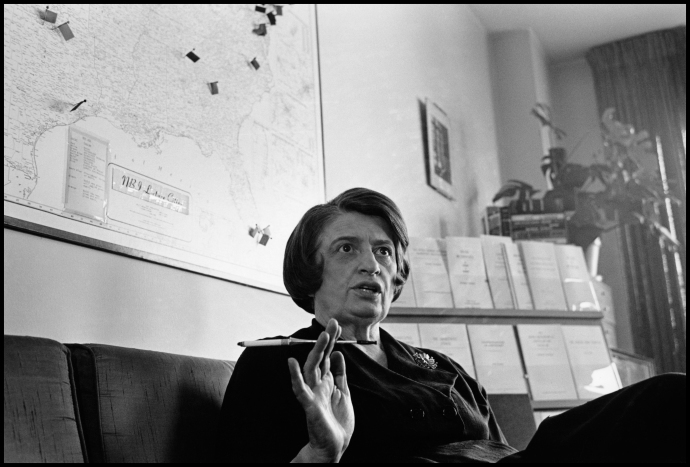 Continue reading: The System that Wasn’t There: Ayn Rand’s Failed Philosophy (and why it matters) -Nicholas McGinnis | The Rotman Institute of Philosophy. via Clinical psychologist explains how Ayn Rand helped turn the US into a selfish and greedy nation. In America, libertarian ideas are attractive to mostly young, white men with high ideals and no life experience that live off of the previous generation’s investments and sacrifice. I know this because as a young, white idiot, I subscribed to this system of discredited ideas: Selfishness is good, government is bad. Take what you want, when you want and however you can. Poor people deserve what they get, and the smartest, hardworking people always win. So get yours before someone else does. I read the books by Charles Murray and have an autographed copy of Ron Paul’s “The Revolution.” The thread that links all the disparate books and ideas is that they fail in practice. Eliminate all taxes, privatize everything, load a country up with guns and oppose all public expenditures, you end up with Honduras. In Honduras, the police ride around in pickup trucks with machine guns, but they aren’t there to protect most people. They are scary to locals and travellers alike. For individual protection there’s an army of private, armed security guards who are found in front of not only banks, but also restaurants, ATM machines, grocery stores and at any building that holds anything of value whatsoever. Some guards have uniforms and long guns but just as many are dressed in street clothes with cheap pistols thrust into waistbands. The country has a handful of really rich people, a small group of middle-class, some security guards who seem to be getting by and a massive group of people who are starving to death and living in slums. You can see the evidence of previous decades of infrastructure investment in roads and bridges, but it’s all in slow-motion decay. See full article at: My libertarian vacation nightmare: How Ayn Rand, Ron Paul & their groupies were all debunked – Salon.com. via Free markets killed capitalism: Ayn Rand, Ronald Reagan, Wal-Mart, Amazon and the 1 percent’s sick triumph over us all – Salon.com. via 11 questions to see if libertarians are hypocrites – Salon.com. Sorry, Ayn Rand. Your fiction has been exposed as, well, fiction. Libertarians have always been flummoxed by inequality, tending either to deny that it’s a problem or pretend that the invisible hand of the market will wave a magic wand to cure it. Then everybody gets properly rewarded for what he or she does with brains and effort, and things are peachy keen. Except that they aren’t, as exhaustively demonstrated by French economist Thomas Piketty, whose 700-page treatise on the long-term trends in inequality, Capital In the 21st Century, has blown up libertarian fantasies one by one. If we could do that, he promised, we’d not only get freedom and efficiency, but more equality as a natural byproduct. Libertarians who took the lessons from his books, like Capitalism and Freedom (1962) and Free to Choose (1980), bought into the notion that capitalism naturally led to less inequality. How did libertarians get it all so backwards? Well, as Piketty points out, people like Milton Friedman were writing at a time when inequality was indeed less pronounced in the U.S. than it had been in previous eras. But they mistook this happy state of affairs as the magic of capitalism. Actually, it wasn’t the magic of capitalism that reduced inequality during a brief, halcyon period after the New Deal and WWII. It was the forces of various economic shocks plus policies our government put in place to respond to them that changed America from a top-heavy society in the Gilded Age to something more egalitarian in the post-war years. The fortunes of these rentiers were not shock-proof: If you remember Hockney, the baddie in James Cameron’s film, he survives the Titanic but not the Great Crash of ’29, when he loses his money and offs himself. The Great Depression got rid of some of the extreme wealth concentration in America, and later the wealthy got hit with substantial tax shocks imposed by the federal government in the 1930s and ’40s. The American rentier class wasn’t really vaporized the way it was in Europe, where the effects of the two world wars were much more pronounced, but it took a hit. That opened up the playing field and gave people more of a chance to rise on the rungs of the economic ladder through talent and work.